Benner Township Planning Commission - April 25, 2019 @ 7 p.m.
Benner Township Supervisors – May 6, 2019 @ 7 p.m. Water Authority - The Third Tuesdays monthly at 6:30 p.m.
Brush Collection: Call by April 26th to be on the list. 355-1419 Brush must be at the curb on Monday, April 29th. Bulk Pick Up – The week of May 13th on your normal garbage day. 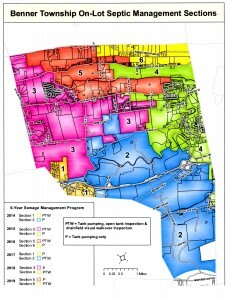 The Township’s Planning Commission and Board of Supervisors have been working to revise the Township’s Zoning Ordinance for the last several years. Please visit the proposed zoning page above to view the proposed ordinance and to view the comments that we have received to date. The draft ordinance can be viewed by clicking on the following link Benner Draft Ordinance 2-12-19 Click this link BennerZoning_March_2019 (1) for the proposed zoning map (updated 3/19). The only changes to this map from the previous one is in the colors of the various zoning districts and the addition of slightly more commercial area on the property owned by Trevor Meyer along the Benner Pike. Septic Management Ordinance - Was adopted on May 19, 2014. Below is the map indicating the various pumping/inspection schedule. Pamela Winter is the Administrator of this program. She can be reached by calling (814) 470-0606 Her mailing address is P.O. Box 117, Millheim, PA 16854 . The Township’s trash hauler is Advanced Disposal. They can be reached by calling (814) 237-3713. Looking for a unique gift? There are still a number of the Benner Township History Books available. This hard bound book is now available at the cost of $15.00. This book is filled with pictures and lots of stories about the families that settled here in Benner Township and the industries that followed. Stop by the office during regular business hours or call 355-1419 for a list of evening hours for your copy. ACT 13 Report of Unconventional Gas Well Fund Usage Report. Click here to view Benner Township’s 2012 report. Click 2014 Gas Usage Report to view Benner Township’s 2014 report. Click 2015 PUC Act 13 Usage Report to view Benner Township’s 2015 report. Click 2016 Act 13 Report to view Benner Township’s 2016 report. Click 2017 Act 13 Report to view Benner Township’s 2017 report.